Jen Stratton & Team Possible | EDUCATE. INSPIRE. EMPOWER. Behind every great athlete is a team of supporters. Most often, they are parents who commit to driving to practices, to cheering through games, and to providing the financial backing for equipment and uniforms. Sometimes, parents even take on the role of coaching. Mike and Jodi Kadinger have held all of those roles while their son, Marcus, proved himself on the basketball court, the track, and the football field. As a one-handed player with an upper limb difference, it was a challenging journey. 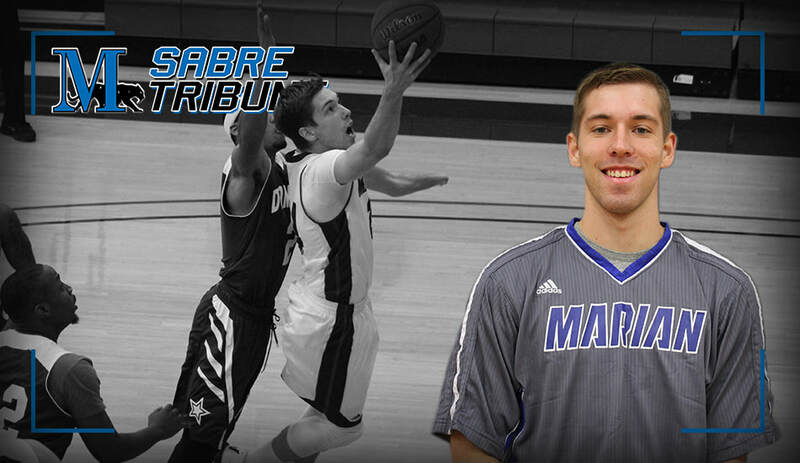 However, in the end, Marcus persevered and reached his goal of playing college basketball. In this interview, Jodi and Mike reflect back and share some insights into how to support and develop a gritty athlete no matter the odds. What resources or organizations would you recommend to other parents who may have a child with a limb difference or another type of exceptionality? Mike & Jodi: We went to Shriner’s for Marcus’ first prosthetic. We thought he would need it to learn to crawl, but he barely used it. We encouraged him to wear it in early elementary school. He would go off to school wearing it, but it kept coming home in his backpack. It just wasn’t for him at that time. Later, when he got older and we were doing family activities like kayaking or he was weight lifting for school, he started to think of his prosthetic as a tool. Then, he would go to Shriner’s and ask them for a prosthetic for this or that. He owned it and wanted it to fit his need. In his interview, Marcus mentioned struggling with developing his confidence and accepting his differences, how did you support him when his confidence faltered? Mike: As he said, Marcus has always been his own worst critic. In eighth grade, he hit a rough patch. He was really down on himself. We would try to be positive, but we didn’t see things the same way as Marcus. We didn’t have one hand. It was then that I reached out to a friend, Kevin Monson. He has the same condition as Marcus. He was older, had a family, a career, and was an accomplished athlete. He had played football, basketball, and pitched in baseball. He was even a coach. Marcus defined grit as “mental toughness” and talked about “getting through adverse situations and keeping your head held high.” How did you help Marcus develop his grittiness? Mike: Basketball really brought it out in Marcus. He was always trying and playing hard to win. On the court, he learned that you have to do the little things right. You have to practice and put in the time. During Marcus’ freshman year, I was the JV coach. The varsity team was horrible. The head coach brought up Marcus and another freshman to start. They got smoked. He wasn’t ready. How did you teach him to deal with the failure? What advice do you wish someone had shared with you when Marcus was young? Mike: Expose them to as much as you can. When you introduce them to things they like, it builds their confidence. Help them find what they like. You usually like what you are good at. Jodi: We didn’t focus on the fact that he doesn’t have a left hand. He is more like others, than not alike. Sometimes, parents go through a rough time. We just loved him. We knew he needed to live in this world and adapt because we knew the world was not going to change for him. It is a set of skills and strengths that you have. Ability is the measurement of those of skills and strengths. You will be good at some things and not at others. How did you teach Marcus to tie his shoes? What did you do when people suggested he play soccer and not basketball? How do you feel about pirate books? We chatted about the importance of finding role models for our children and new challenges in life as they become adults like dating, raising a family, and employment. But it was Mike saying, “We will talk again. Stay in touch,” that made feel like I knew who I could lean on when we hit a rough patch with Ian. Thank you, Mike and Jodi! What steps helped you achieve your dream of playing college basketball? Being a one-handed player, what adaptations or modifications did you need to make to develop your game? When I was younger, I was uncomfortable using my left side. I learned to use a quick first step to get around the defender. My jump shot developed naturally, and slowly I became more confident. Eventually, I learned one or two quick moves on my left side, which the defenders were not expecting and then a spin move. I just had to play smarter. What challenges did you face during your basketball career? I was always my own worst critic. Sometimes, I had confidence issues which made meeting new people hard. I had to learn to embrace my differences and not let them alienate me from people. Being an amputee, it’s just… I didn’t ever meet anyone like me. Who has inspired you along your sports journey? My dad. My parents have been very influential. They were always encouraging me. When I was younger Coach Booth made a big impact on me. He taught me that life is bigger than basketball. He would ask me, “What are you doing to be a good person?” He always included everyone on the team. Everyone had a role. I have a one-handed basketball player in my house. What advice do you have for my son, Ian? I went to a lot of camps. You have to learn to move with the ball, to dribble in and out, and you have to push yourself to train like everyone else. You have to try to dribble on both sides, even for just one or two moments. The more you try it, the more confident you become. I really didn’t start dribbling on my left side in a game until middle school. I wished I had tried sooner. What are your post-college dreams for yourself? I am graduating this year as a psychology major. Eventually, I would like to work at Shriner’s Hospitals for Children and counsel children who are amputees like me. Of course, I will always want basketball in my life. So, I hope to continue to work at summer camps, coach summer league, and someday coach at the high school level. What advice do you have for parents and coaches of athletes with limb differences? You need to let kids figure it out on their own. Let them do it their way. Be there for them and keep encouraging them to keep trying. They will always find a way. Ability is your desire to act on your God-given gifts. We all have unique gifts. It is just up to us to pursue them. How would you define grit? Grit is mental toughness. It is getting through adverse situations and keeping your head held high. Marcus is an impressive student-athlete who plans to make a difference in this world by working with young people. In our house, we have already benefited from Marcus’ positive attitude and encouragement. After seeing videos of Marcus play basketball and hearing that Marcus was encouraging Ian to dribble with his left side, he gave it a try. First in practice, and then in his last basketball, Ian dribbled twice with his “little hand” while bringing the ball down the court. Thank you, Marcus, for being a role model and sharing your sports story! Keep believing in the Possible! “I’m just so happy!” Ian shouted from the back seat on the way home from Caitlin’s baseball game. “Me, too!” I responded as I drove along thinking about how it was almost Friday and that I had nearly made it to the weekend. WAITTT!!! WHAT IS HAPPENING HERE?!?!?! Let me get this straight, Ian wants to see his birth mom because he is so happy that we are getting ice cream. Not how I had imagined the topic would arise. And now…Caitlin is telling him that he can’t because…ARE YOU KIDDING ME?!?! I thought about all the situations and topics covered in the adoption books I read or the classes I had taken. Nope, not one covered ice cream happiness and birth moms. So what do I do?!?!?! All I could do…breathe. I took a really slow… deep…breath. “Caitlin’s right. She might be dead,” Ian stated sadly. Glimpse #2: Watching Ian do flips in the water can teach me lessons about life. In January, we went to Mexico on our first family vacation. The warmth and sunshine was a wonderful escape from the harsh cold New England winter. Everyone’s favorite activity was playing in the pools. Ian loved learning to do flips in the water and was working hard to perfect this new skill. I stood poolside in amazement as Ian fluidly and effortlessly completed three backward flips in a row under the water- A TRIPLE FLIP! I honestly couldn’t believe it. Why so amazed? Well, to start Ian had learned to swim only six months earlier, and he never had a formal swim lesson in his life. Later that night, I’ve watched the video over and over again. Then, I realized that with each backward flip Ian was teaching me a lesson. Flip #1: Let go! Just let go and let life happen. Flip #2: Have hope. No matter where we start, there is always hope that we can do more and be more. Flip #3: Believe in your own potential. The only limitation is your mindset. Glimpse #3: Love is powerful. With Ian in our lives for 17 months, we laugh harder, say ‘I love you’ more, and take simple things for granted less. Ian has shown us that when you let love into your life, joy follows. Yes, there are unexpected hard moments that make you grow in ways you never thought possible but that’s life. So, let the love in! I am so excited to introduce you to Sam Kuhnert, Founder of NubAbility Athletics Foundation, an organization where children with limb differences receive training in mainstream sports from coaches with limb differences. NubAbility Coaches teach campers to embrace failure. They know that when we fail, we learn. NubAblity Coaches teach athletes that they need to be willing to put in the time and effort to succeed. What does Sam hope athletes with limb differences gain from participating in Nubability camps? I want them to know that everybody was created perfectly and that they can handle anything. I want kids out of the stands and into the game. There are a lot of life lessons that can be learned through sport. What are Sam’s dreams for his organization and its athletes? My ultimate goal is to see NubAbility worldwide. I want to offer clinics across the globe because, in other countries, people born with limb differences or amputees are seen as cursed. They are cast off and kept out of the public. Sport can change the way people are seen. LISTEN UP: What advice does Sam have for parents and coaches of athletes with limb differences? Don’t ever let them use their limb difference as an excuse. It becomes addicting. Push them to keep going even during times of adversity. Never let them know when you doubt them. And remember, it’s okay to let them fail because they will fail in their lives. It’s how we grow and get better. How does Sam define ability? Ability is the opposite of disability. It is being able to…Every person has the ability to do anything. If they have the will, they can do it. You’ve got to have grit. What’s grit according to Sam? Grit is being able to push through when people tell you that it’s too hard or you can’t do something. Grit is when you keep climbing no matter how high or how many times you might slip and go back to the bottom. You keep going. You keep pushing. You keep driving. You will make it to the top. 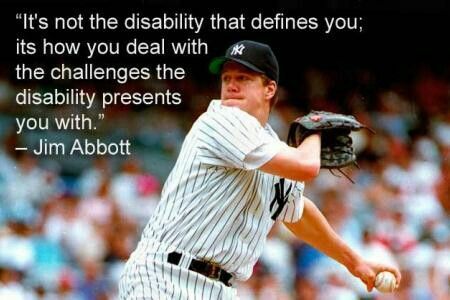 Jim Abbott. At 2-3 years old, I would sit on my dad’s lap and watch videos of Jim pitching in the major league. I would see how he owned his difference and how he wasn’t afraid of anyone. I saw how he used his platform for good and he owned who he was. I wanted to be like him. After speaking with Sam, I knew that I had just met someone who believes in the limitless potential of every individual and who is making a difference in this world for young people. Of course, I also loved that we both admire Jim Abbott for his ability to play baseball and use his platform for good. If you are impressed with Sam and he has you motived to reach your greatest potential, please contact him. He is available for speaking events. Just check out Keynote for a Cause on the NubAbility website. This is how most conversations start with Ian. His questions range from “Mom, how did we get our last name?” to “Mom, do you know what superpower I want to have?” Most of the questions occur in our minivan as I race around after work driving kids to basketball practice, picking up a rotisserie chicken at the grocery store for dinner, and thinking about those work emails that I should return. “Well, I don’t know. The military has special rules about becoming a pilot and I am not sure if they would let you.” I pause and sigh again. Then, I add the words that make my shoulders sag and my heart ache. “Maybe,” I reply feeling exhausted. Exhausted because this territory of raising children with exceptionalities never lets you retreat. Exhausted because fear seeps into every crevice of your life leaving you questioning your actions, worried about their future, and so wishing you had time for a comforting afternoon tea. The discussion ends abruptly when I pull into a parking spot in front of the library. Distracted by the idea of picking out new books, Ian and Caitlin jump out of the van and run into the library. I walk slowly behind them wishing I had better answers for his questions. See, Mom, Ian can learn to fly. I have never loved Caitlin’s YouTube watching more. Jessica Cox, I have never loved being wrong more. Lastly, I have never been more proud of my kids and how they see the world! I hope they learn to fly and prove me wrong over and over again. It took a lifetime to adopt Ian. It took falling in love with a man who embraced the idea of creating a family in whatever ways we were blessed. It took having two challenging pregnancies filled with moments that terrified me. It took two premature deliveries, a stay in the intensive care nursery, and an ambulance ride with a newborn. It took dreaming of having a third child. It took being told we weren’t ready to adopt a sweet little girl from Korea. It took tears and heartbreak as I recycled the paperwork confirming our failure. It took a move to a new town. It took a prayer in the quiet of the morning. It took the courage to open my heart and an email. It took a long Sunday walk with my husband. It took talking with our son and daughter about a little boy with a limb difference across the world in need of a family. It took a nerve-wracking phone call to the adoption agency. It took sharing this very personal dream with close friends to get our initial three letters of reference. It took letters from our police department, our employers, and our doctors just to start. It took ensuring every document was properly notarized. It took trusting the UPS service representative with our life and dream in an envelope. It took waiting and waiting. It took getting a US seal on every document. It took a code from the US consulate. It took a visa from China. It took a 16-hour flight over the top of the world. It took courage and faith in the power of love. It took a door to open and a little boy to walk through it. It took the tears of the nannies who loved him for the first seven years of his life. It took the incredible love of his birth mother. So how long did it take? It took a lifetime. It also took the most intense love I have ever felt. But please know, adoption is the journey of a lifetime. When I started this blog, I thought I knew why I was writing. My “Why?” was to raise awareness about athletes of all abilities. It was to share the incredible sports stories of what is possible when we redefine ability. My plan was to change people’s lives by changing how they viewed the world. My “Why?” was never intended to change me, my life, and how I viewed the world, but it has. And now, my blog must change…evolve to include this new perspective. It seems a natural entry point for this new additional focus of the blog to be the answer to this question: Why did you adopt? I know many people have wondered “Why?”, however, only a few people have actually asked me about the decision. It’s the elephant in the room. For many, it didn’t seem to make sense. We had two beautiful healthy children, one boy, and one girl. We had successful careers, a nice home, etc. It appeared we had achieved the American Dream. So “Why?” Well, the answer is easy because we were fulfilled and we realized that our dream was different. Our dream included finding a meaningful way to share our life, our children, our home, and our love. So, because we had two beautiful children, a home filled with love, careers and so much more, we decided to open our hearts to adopting an older child. I know. This answer leads to the next question. “Why Ian?” Another easy answer. “The Universe.” Yup, you heard me, the Universe is responsible for Ian joining our family. Don’t believe me? Then, how else do you explain that when you randomly open an email about a boy from China in need of a family he has the same birthday as your oldest son? How else do you explain that as you read the description of this little seven-year-old boy he sounds like a perfect combination of the children already in your home? How do you explain that when you continue reading you learn he has an upper limb difference and you have spent the last two years hosting a blog on athletes with physical exceptionalities? Not the Universe? Then, tell me…Why else would you cry and talk to a computer screen saying, “I think we are your family,” when you learn that he has been asking the nannies in his orphanage to find a family for him? Why else would your heart literally burst with love when you look at the smiling face of this little boy who lives halfway across the world? I’m telling you… the Universe built my family. Sometimes, things are bigger than just you and you need to simply embrace it. So there you have it, the start of my new “Why?” and adventure in blogging about adoption. Before I go, I do have a few people to thank. Laurie, thank you for helping me give myself the permission to share the stories that I am scared to write. Brene Brown, Anne Lamott, Glennon Doyle, and Elizabeth Gilbert, thank you for honestly sharing your stories and leading the way in living a heartstrong life. Your writings give me the courage to share my own. Seth, thank you for walking this life’s journey with me. Nolan, Caitlin, and Ian, thank you for giving me the courage to be your mom. Readers, thank you for your support. I hope you enjoy this new addition to my blog. If you have any thoughts, stories or ideas to share, please let me know. Keep Believing in the Possible! We heard about AmpSurf from a neighbor the summer before Ian joined our family. When she told me about their offerings, I couldn’t help but think that it was a little bit of fate. You see, AmpSurf is a non-profit organization that offers free adaptive surfing clinics to amputees on both the east and west coasts of the US, and they host one in Maine where we love to spend the summer months. During a snowy January day, I registered for the August clinic hoping he would come to love the cold waters of Maine. Eight months later, after learning to swim and armed with a cozy black wetsuit, Ian was eager to try out a sport that his big sister loves. The morning started with a warm welcome and an announcement that the best surfer on the beach is the one with the biggest smile. Caitlin leaned over to me and whispered, “I think that will be Ian.” The announcements were then followed by some dry land instruction on a wobble board and safety tips. Then, in heats, each surfer clad in a brightly colored AmpSurf shirt hit the waves with their team. A team consisted of one surf instructor and four water volunteers who guided participants on their ride into the beach. Ian was in the green heat and his instructor was Steve. He told us he was determined to stand up, and on his first wave, he DID. In fact, on every wave, he popped up and got into his best surfing stance. He did have one big wipe out, but a volunteer was right there and scooped him out of the water quickly. Then, in full Ian fashion, he stood up proudly and with a huge smile on his faced waved to us. Thank you AmpSurf for providing Ian, our family, and all of the participants with an incredible morning! We are already looking forward to next year! If you are interested in learning more about AmpSurf, donating, or volunteering, please contact them at surf@ampsurf.org. At the end of every baseball game in Ian’s Coaches Pitch League, the coaches select a player who gets the game ball. Often the game ball goes to the player who made a clutch catch, hit a double or tagged someone out during the game. It is an honor to receive the ball, and the young players cherish getting the game ball more than a win. Ian walked slowly up to the plate dragging his electric-green bat behind him. He positioned his feet parallel to the plate, slung his bat over his shoulder, got his back elbow up and looked at his coach signaling he was ready. Kneeling on one knee, Coach Nick lobbed the ball over home plate. Ian swung…and missed. Ian swung at the next ball and missed. He continued to swing and miss until the fifth ball. This time he swung and tipped the ball only to have the ball hit him in the forehead. After rubbing his head and talking to Coach Rori who checked his head, Ian once again took his spot at the plate. This time looking tired and a bit nervous. Ian held tightly to the bat, swung and missed. On the next pitch, Ian swung and hit the ball. It wasn’t a big hit. It didn’t even get past the pitcher’s mound, but it is enough for Ian to make it safely to first. Once on base, Ian jumped up and down waving his arms triumphantly in the air. Everyone cheered, and I felt like I was in a Disney movie as the tears welled up in my eyes. I can’t thank the coaches enough for what they taught Ian at that game. He learned to persist. He learned that when you surround yourself with others who believe in you that you can exceed your own expectations. Most importantly, Ian learned that he can do anything. I also want to thank all of the players and their families. I am so grateful for all of the support you have shown Ian throughout the season. It makes me proud to be a part of this community where differences are celebrated. And just when I thought I couldn’t be more amazed by this baseball season, Ian ended his last game by taking the mound and pitching. Watch out Jim Abbott! Finally, keep believing in the possible! I do. Next week, we celebrate Ian being in our family for eight months, and it has been a beautiful journey powered by love. The only way I can describe the journey is living intensely from the heart- making it absolutely joyous while being incredibly exhausting. But now that I think about it, I guess that is how one could simply describe parenting. For a person who loves the written word, I often find myself unable to write or speechless over these past eight months. I catch myself just standing still in awe watching Ian redefine what is possible for himself and anyone fortunate enough to witness how he takes on this new world. For his peers, he does this in school when he bravely shares stories about his life in China during class discussion. For his teammates, he does this on the baseball diamond when he plays second base, fields the ball and throws a player out on first Jim Abbott-style. For me, he does it everywhere we go. I mean everywhere- at the grocery store, the doctor’s office, the YMCA…everywhere. When I do force myself to take a moment to breathe deep and observe Ian with his siblings, my eyes well up with tears. Literally strangers only 240 days ago from vastly different cultures and life experiences, they now cuddle on the couch in their pajamas, fight in the car on the way to school and tease each other over dinner. They are your typically troublesome trio and when they team up, watch out! With their creativity, energy, and perseverance, there is nothing that will stop them…well, except maybe bedtime. These eight months have been the greatest gift that I have ever received, and I will share a few of the moments with you here in pictures. I hope these photos fill your heart with love and joy. I hope they make you believe in the possible.